JOHNATHAN Thurston fears Roosters star Cooper Cronk faces an uphill battle to be fit for Sunday's grand final clash with Melbourne if his shoulder injury is similar to the issue which ended his 2017 season. 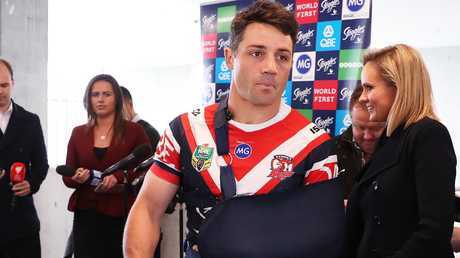 Cronk suffered a severe left rotator cuff injury just before halftime of the Roosters' preliminary final win over Souths, and conceded yesterday he is a "long shot" to play against his former teammates in the decider. The 34-year-old, contracted to the Roosters for next year, could risk career-ending damage if he takes the field against a ruthless Storm outfit, who would target their former favourite son at every opportunity. 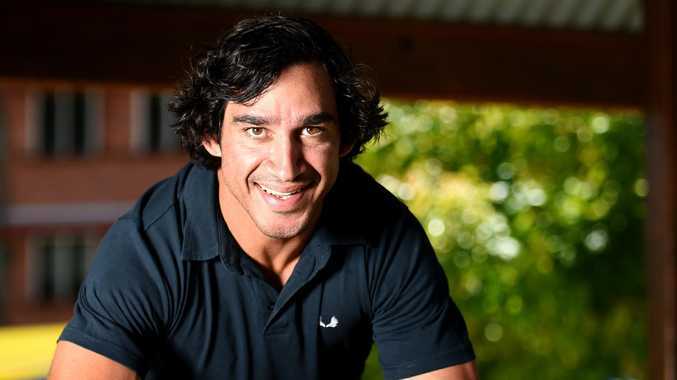 Thurston underwent season-ending shoulder surgery days after he damaged his rotator cuff in Origin II last year, forcing him to watch North Queensland's grand final loss to Melbourne from the sidelines. But Thurston said yesterday Cronk is selfless enough to rule himself out of the grand final should he be unable to compete at anywhere near his best. "I don't know the full extent of his injury but if it's anything like mine, it's going to be tough to be out there. Hopefully they can strap it, and he'll be all right," Thurston said of his long-time Queensland halves partner. "He has a team first mentality and knowing Cooper, I don't think he'd be out there as a passenger. "He understands that, and no doubt he'll have a different role if he can't play. "He'll be making sure whoever fills his shoes is fully aware of what they need to do for the team, and he'll certainly put the team first." 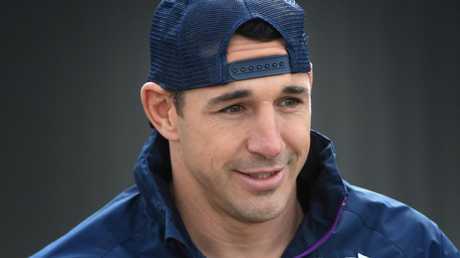 Thurston was also adamant Storm fullback Billy Slater has a realistic chance of avoiding being rubbed out of the grand final for a shoulder charge on Sharks winger Sosaia Feki in Friday's preliminary final victory. Slater will join Thurston in retirement at the end of the year and will attempt to beat the charge at the judiciary tonight. Thurston is adamant the 35-year-old has a good enough case to overturn the decision and ensure he ends his outstanding career on the biggest stage. Slater was penalised after his shoulder made contact with Feki as he ran at speed to stop the Sharks winger scoring a try in the first half. But Thurston insists it was an example of an unavoidable incident that happens regularly in the game. "I think there's enough evidence to overturn it," Thurston said. "When you slow it down, before he makes shoulder contact you can see his right arm start to come up to try and wrap it around. "The contact doesn't allow him to get his arm around, I think there's enough evidence there (to beat the charge). "It's just a heavy collision that's part and parcel of the game. "To the letter of the law he's been charged, but I think there's enough evidence to have it overturned." Cronk fronted media with his shoulder in a sling yesterday, but has vowed to do everything he can to make himself available for the match. 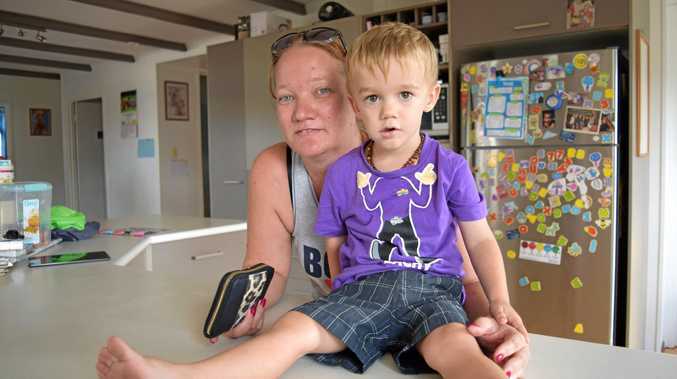 "I could move it, the best thing is just to immobilise it so I can get some recovery done, try and strengthen it up so the muscles don't get worked over too much," Cronk said. "The whole idea for the sling is to keep it in place, so it's protected, and do everything I can." "I'm a long shot. That's not lying," he said. Should he complete a miraculous recovery, the Roosters playmaker is certain to need a painkilling injection and is adamant he could play through the pain. The Blues came under fire for failing to target Thurston in the defensive line enough as he played through his shoulder injury last year. He would go on to kick the game-winning conversion which levelled the series, and gave Queensland the chance to wrap up the series in Origin III. Thurston said Storm coach Craig Bellamy wouldn't be so generous and would devise a plan to target Cronk as often as possible. "It's part and parcel (of the game)," Thurston said. "A lot of players are playing with niggling injuries, but there's not many playing with injuries to that extent."